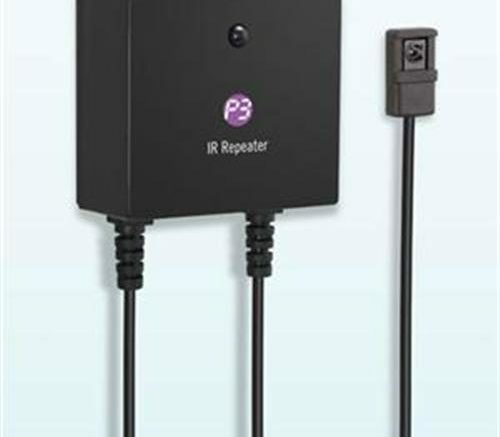 What is an IR repeater? Sometimes you need to think differently. For most people who want to use a remote control to shoot through walls, our NextGen Remote Extender is the best bet. It turns any remote with an AA or AAA battery into a super-powered RF remote. But, sometimes, that’s not what you need. There are some very specific cases when an RF remote is a very bad idea. For example, if you’re trying to mount equipment in a home theater cabinet, but you don’t want the signal to go into other rooms. Think about it, if you have similar equipment in every room, you don’t want to accidentally control the equipment somewhere else. That could be a nightmare. That’s where an IR repeater comes in. What it does is essentially move the infrared “eye” to a different location. A cable runs to the “IR Target” which is where the remote is pointed, then to a simple amplifier, then to an “IR Emitter” which sits in front of your equipment. The result is, infrared signals travel from outside your cabinet to inside. The upside of this sort of solution is that it can be used with multiple remotes and there’s no risk of the remote signal controlling items in other rooms. The downside is that it’s not wireless — you will need a visible IR “eye” and it will need to run, via wire, to the inside of the cabinet. That isn’t as clean as an RF solution but it is an option when other solutions won’t work for you. One such choice is this IR Repeater kit from P3. It’s inexpensive and will give you simple IR repeating for a very reasonable price. If you need custom solutions for controlling more than one component or if you need something with more industrial quality, give us a call at 877.312.4547 and you’ll be connected to a consultant who can help you find the right solution for you!